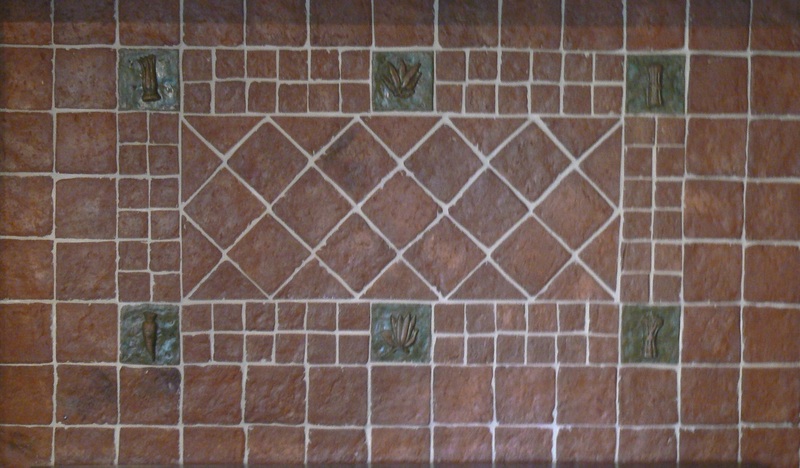 We have some decorative accent tiles available, and custom design and sculpture is always possible at Inglenook Tile Design. 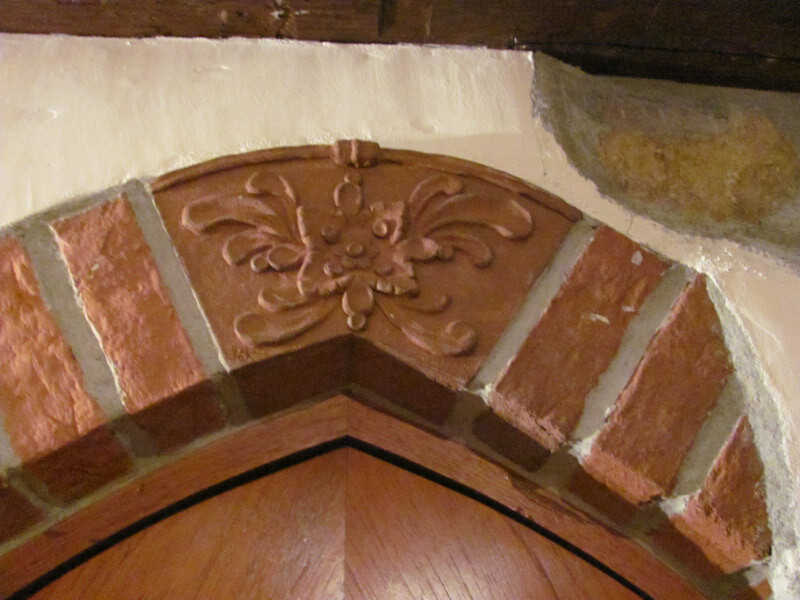 Whether you want a special keystone for an arch, or a relief portrait of your child, we can provide this for you! 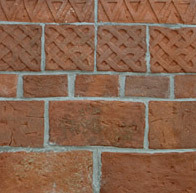 Sometimes, clients ask for stamped impressions of their pets' paw prints, or the names of their grandchildren impressed into the custom bricks. 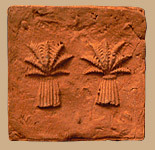 We can press ferns or plants into the wet clay, and when they are fired, an imprint of plant remains. If you can think of it, we can probably make it for you. 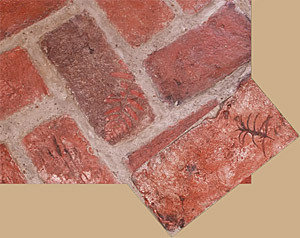 This cow accent floor tile was created from a family heirloom, owned by our customer, Mrs. Haring. 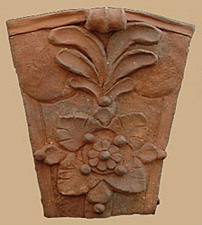 The butter mold was passed down to her from her grandmother. We made a mold of the wooden form, and then created a special tile for the Harings. Note that we placed the image in a "window," so that the high points of the relief would still be at the level of the rest of the floor. That way there was no tripping hazard. The Blume family has two adorable terriers, and they made an impression of their pets' paw prints for us. 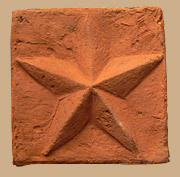 We then made a stamp from the molds, and pressed it into wet tiles. The Blumes wanted it to look as if the dogs were dancing around their food dishes. We have done this many times, with pets, but also footprints of small children. 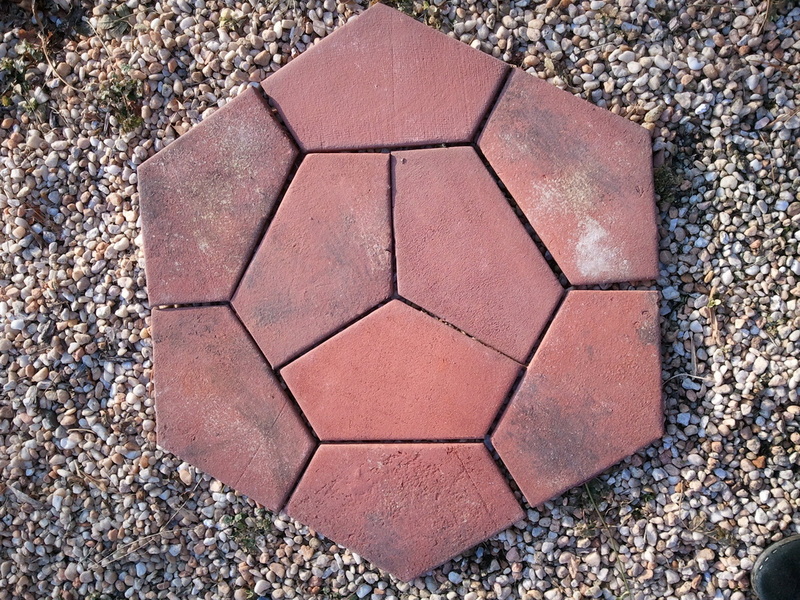 We can also stamp special names and/or dates into the tiles. The words are very small, and subtle. 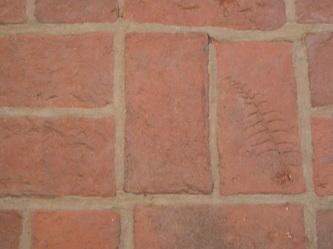 A favorite request is for names of children, or grandchildren, to be impressed upon the tiles. 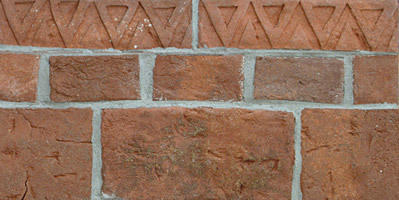 Engraved bricks help preserve family heritage. These are the paw prints of a customer's bunny (a rabbit named Mr. Bingley -- after the Austin character, no doubt)-- immortalized in their floor! 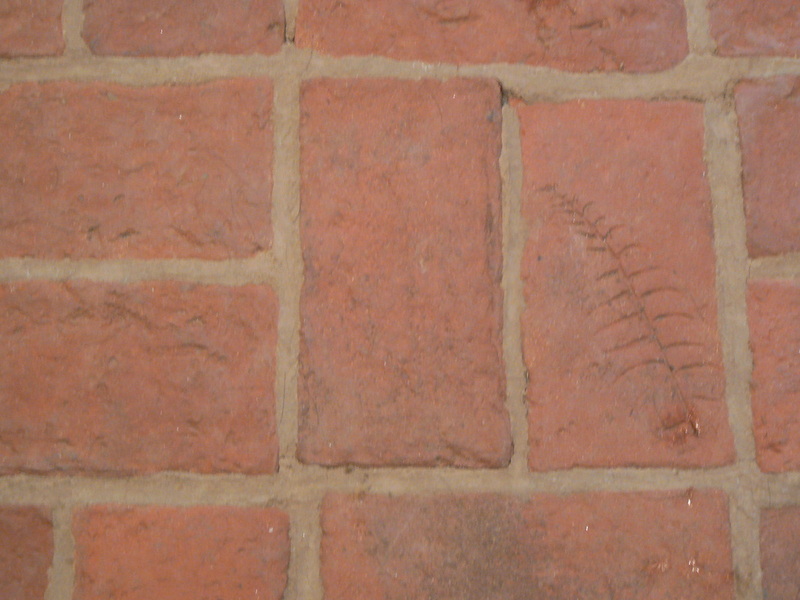 This is a fern, impressed upon the tile before it is fired. 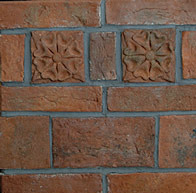 It leaves an impression in the brick, reminiscent of the old bricks that dried in the sun, and then had plants fired into the clay. Those are prized today (like those with the imprint of a brick-maker's thumb! 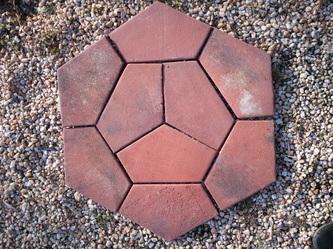 ), and we can make them on your tiles, if requested. Sometimes, people have sent us plants from their own yard or garden, and we use those. 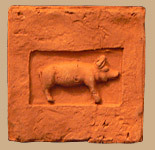 This is the pig tile (see below for a close-up). 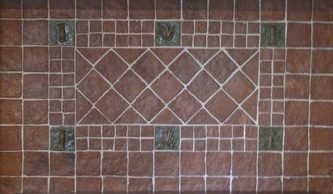 Our customer decided to fill in the area around the pig with grout. This was created for a customer who turned the pig house on their farm into a cozy guest cottage.